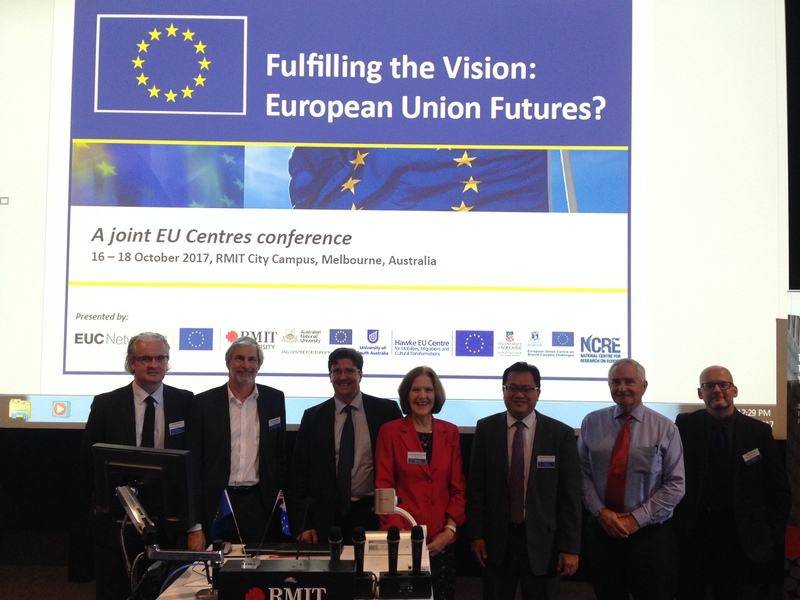 On 16-18 October 2017 the European Union Centres in Australia and New Zealand jointly convened a Conference “Fulfilling the Vision: European Union Futures” hosted by the European Union Centre at the Royal Melbourne Institute of Technology (RMIT) in Melbourne. The Conference brought together 150+ participants from 14 countries including 3 Ambassadors form EU Member States, Australian, New Zealand, European and Asian policymakers, scholars & business representatives. The conference was focused on addressing questions about the future of the European Union and included a series of thematic plenary panels and sessions where a number of academic papers were presented. 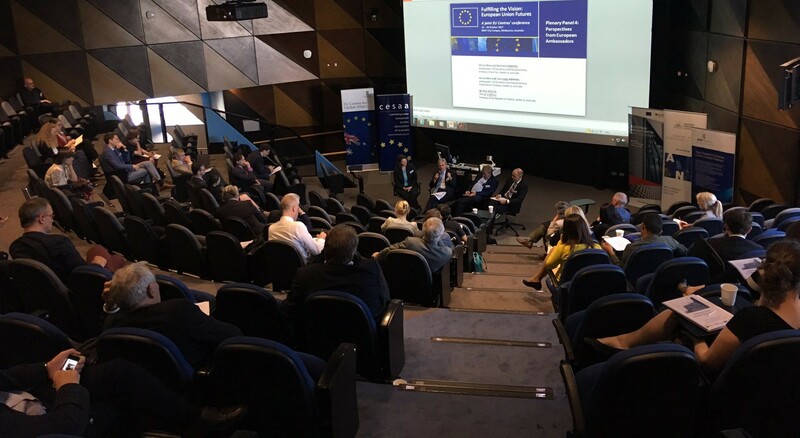 The Conference also provided multiple opportunities to share perspectives from European Ambassadors, the European Commission, the EU Delegation to Australia and business and policy representatives at the special sessions and panels. 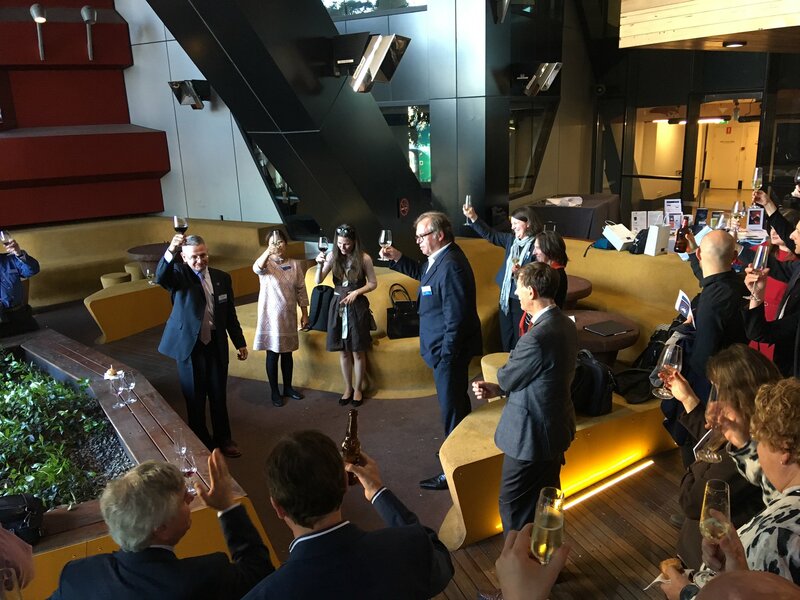 The new Ambassador and Head of the EU Delegation to Australia His Excellency Dr Michael Pulch gave the introductory address, concluding that “The best way to predict the future is to shape it”. On Tuesday 17 October, the EU Centre for Global Affairs released some of the findings from its forthcoming research volume “Potential Benefits of an Australia-EU Free Trade Agreement: Key Issues and Options”, both in the plenary panel on “Harnessing Globalisation to build a better world for the benefit of all” and in the following session on “Towards an Australia/EU FTA”. 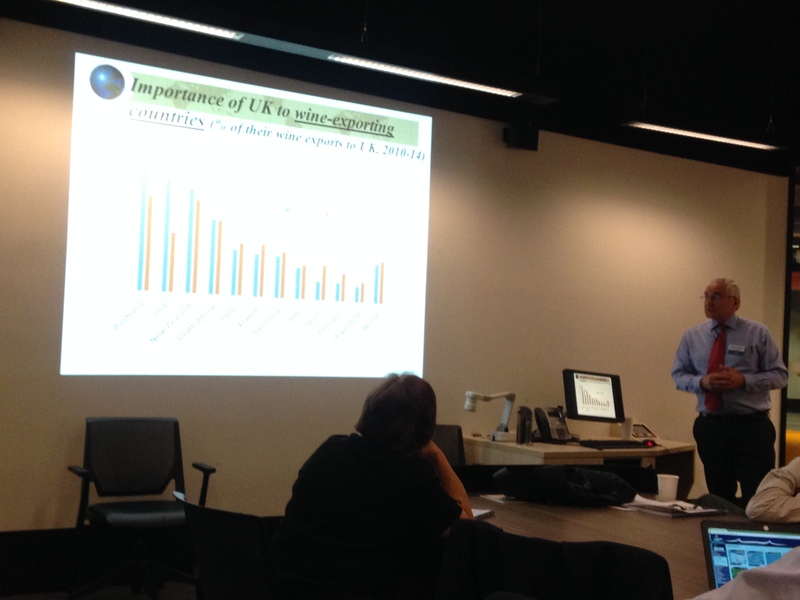 Kym Anderson AC, George Gollin Professor of Economics at The University of Adelaide and Professor of Economics at The Australian National University – “Harnessing globalisation & ICT to improve global food security”. Yose Rizal Damuri, Head of the Department of Economics, Center for Strategic and International Studies, Indonesia – “Harnessing Globalisation to Build a Better World for the Benefit of All”. 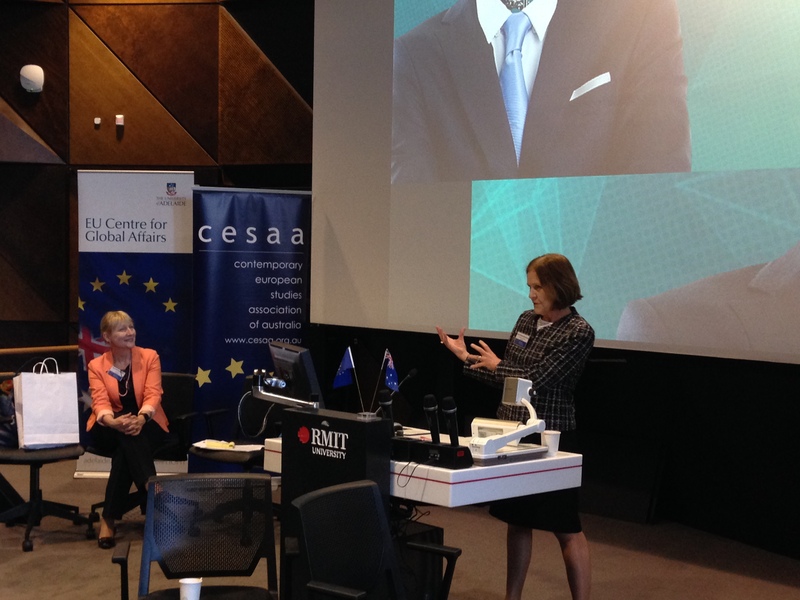 Jane Drake-Brockman, Director of the EU Centre for Global Affairs – “A EU FTA: Shared Perspectives?”. 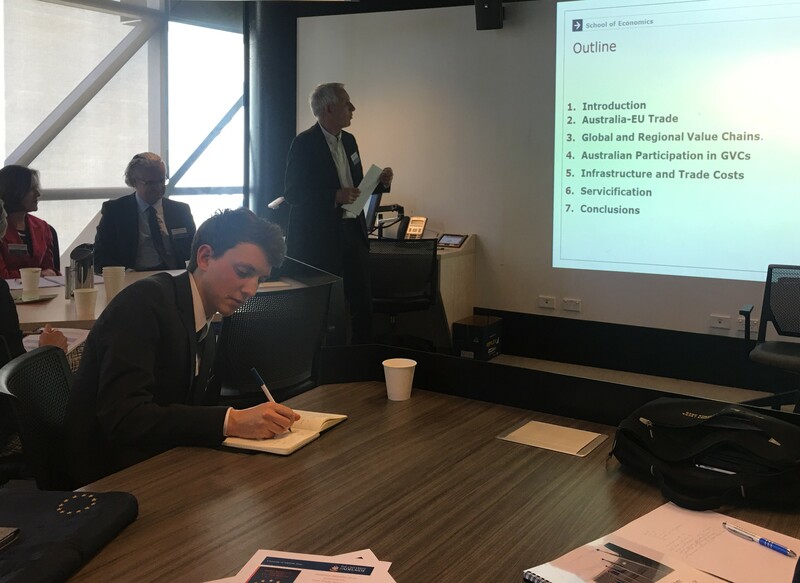 Richard Pomfret, Professor of Economics and Jean Monnet Chair on the Economics of European Integration at The University of Adelaide – “Trade Agreements in the Era of Global Value Chains”. 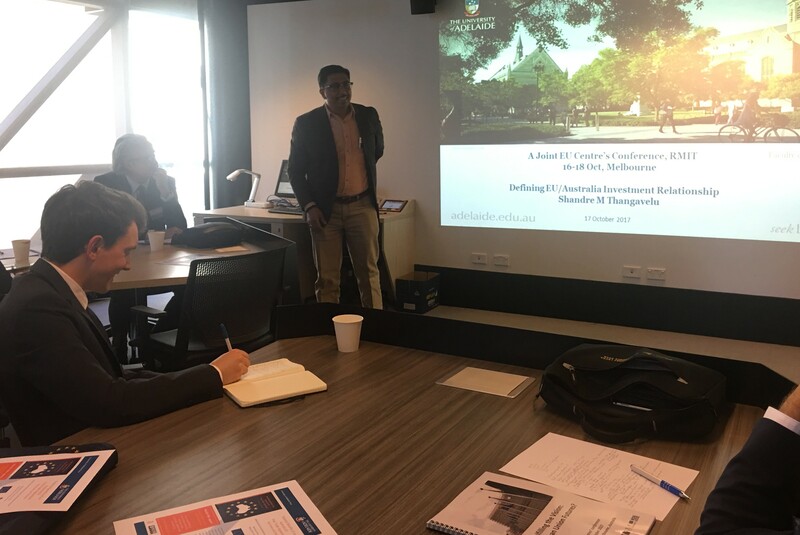 Shandre Thangavelu, Associate Professor, Institute for International Trade, The University of Adelaide – “Defining EU/Australia Investment Relationship”. 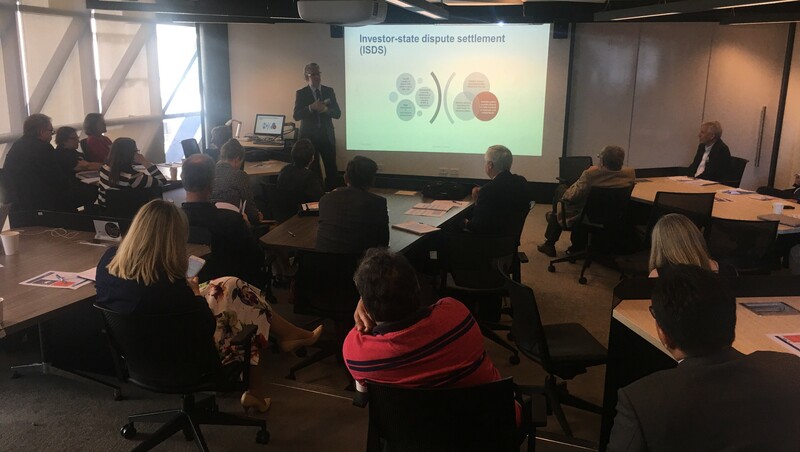 Julien Chaisse, Professor of Law and Director of the Centre for Financial Regulation and Economic Development, The Chinese University of Hong Kong – “Investor-State Dispute Settlement: Thinking Forward”. 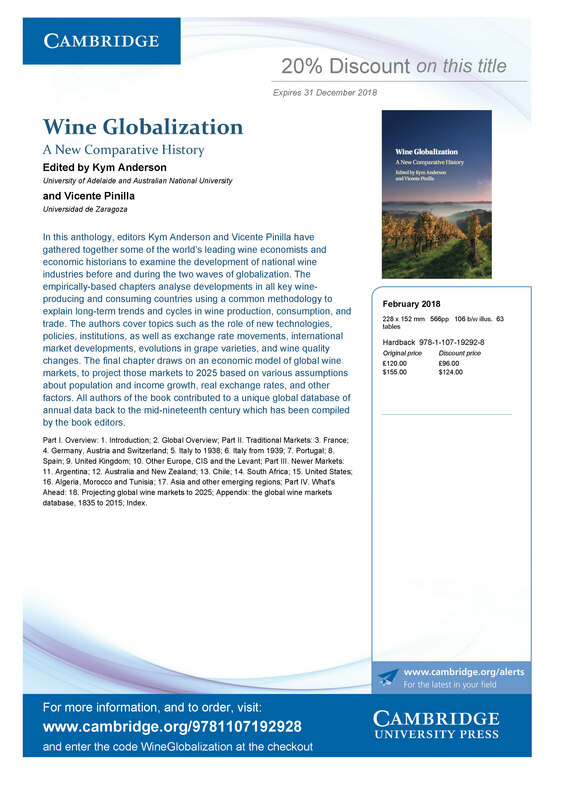 Professor Kym Anderson also released some of the findings from his book “Wine Globalization: A New Comparative History”, supported by an EU Centre for Global Affairs Research Grant Programme, and delivered a presentation on “The UK, EU27 and Global Wine Markets by 2025: Implications of Brexit” in session on “Emerging Trade Issues” on Day 2. Jane Drake-Brockman also joined colleagues from The Australian National Universit in a session on “Barriers to trade in services – new measures and implications for the Single Market” presenting on “Regional Integration in Services: Using the STRI to measure progress with the EU Services Directive and the EU Single Digital Market”. Professor Julien Chaisse, Professor Richard Pomfret and Dr Yose Rizal Damuri also chaired some of the plenary panels and sessions. 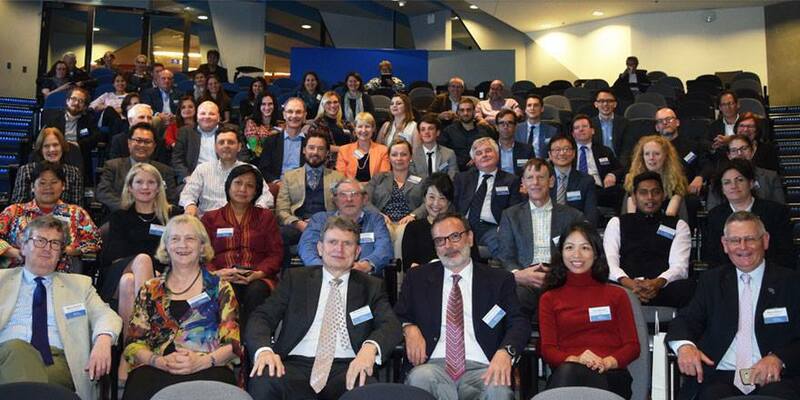 The EU Centre for Global Affairs would like to thank everyone involved – all speakers, participants and organisers! It was a fantastic array of presentations, discussions and ideas. 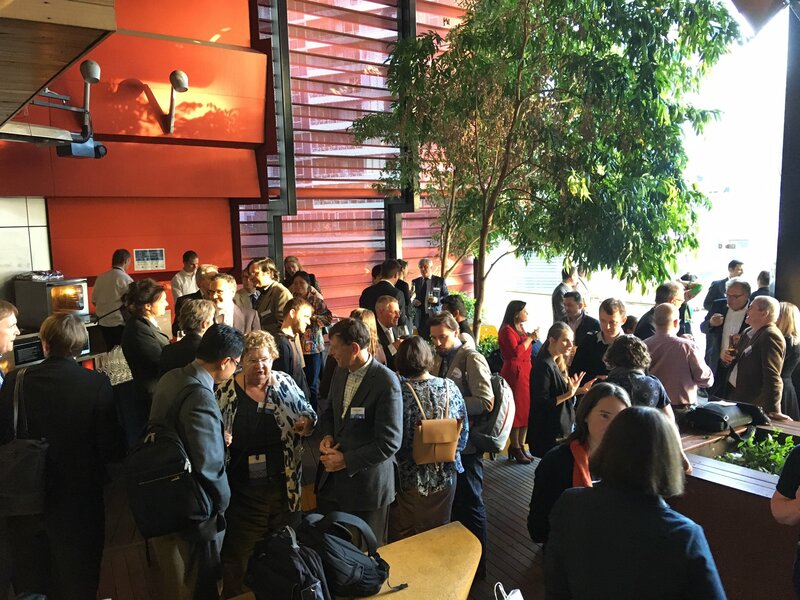 Comments Off on Joint EU Centres Conference – Fulfilling the Vision: European Union Futures? 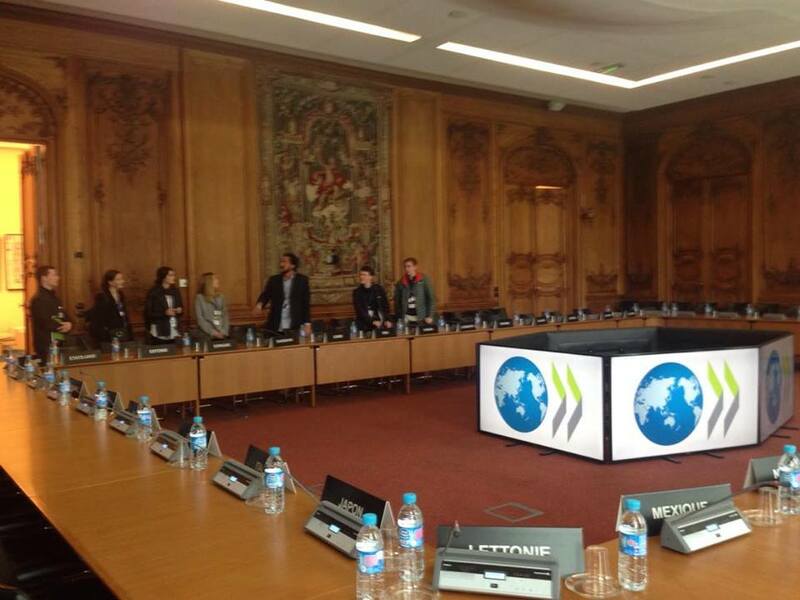 The 10th day of the EU Centre for Global Affairs’ Study Tour marked the student group’s final day in Paris, beginning at OECD headquarters. The first meeting was with John Drummond, who is Head of the Trade in Services Division, and has extensive experience working for the Canadian Government as a Trade Negotiator. The meeting with Mr John Drummond took the style of an open discussion, with him introducing himself and the work he does at the OECD, before answering questions and comments from the students. Discussion ranged from a detailing of the day-to-day work of a trade negotiator, to the Canada-EU Comprehensive Economic and Trade agreement (CETA) as a potential roadmap towards the Australia-EU FTA, and the Canadian perspective on a Commonwealth FTA. The next meeting was with Dr Hildegunn Kyvik Nordås, Senior trade policy analyst with the Trade and Agriculture Directorate. 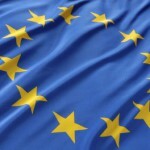 The discussion centred around the EU approach to services market integration, which involves use of a mix of both directives (which establish a common goal but leave member states discretion on how to achieve the goal) and regulations (which set common rules which must be applied by all member states). Dr Nordas drew on the examples of telecommunications (which are governed by a mix of directives and regulations) and engineering (where there are no EU wide regulations) to demonstrate the different impact of these two legislative actions. Dr Nordas used the Services Trade Restrictiveness Index for various EU member states to illustrate the extent of heterogeneity across national regulatory regimes for these two services sectors, and show there were still significant intra-EU barriers to trade in services to overcome. 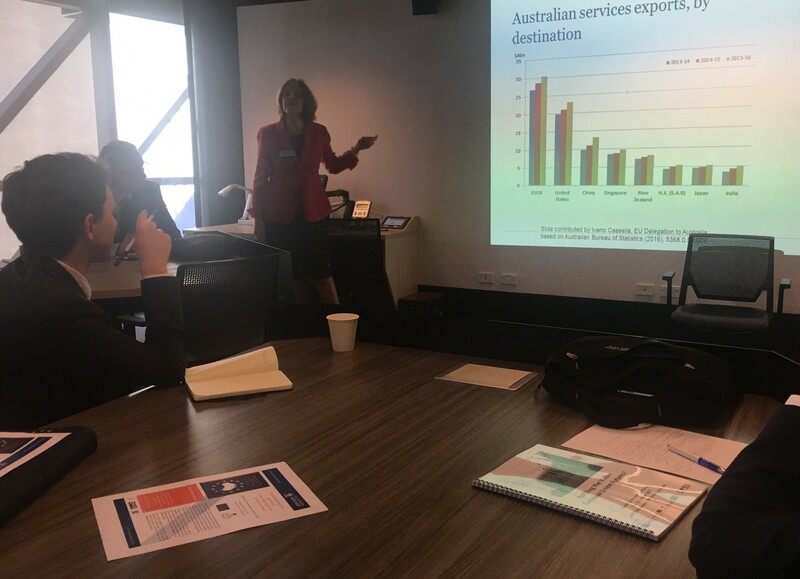 Dr Nordas’ recent presentation at a research workshop co-hosted by the Institute for International Trade and the World Trade Institute in Bern on the EU approach to regional integration in services can be found HERE. Discussion with both Mr Drummond and Dr Nordas continued over lunch, with a focus on the politics behind free trade. This ranged from the broader economic and political trends of the last few decades, to the management of NAFTA after the election of President Trump. 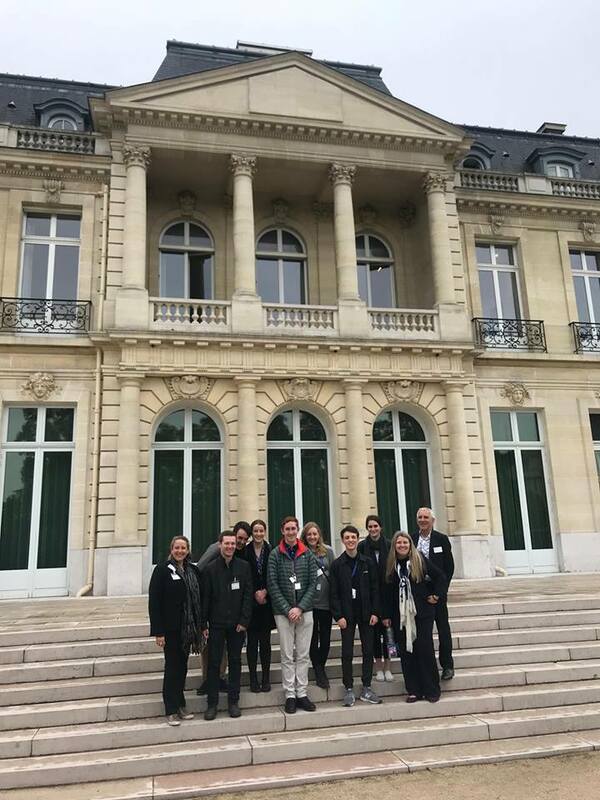 The student group was then treated to a tour of the OECD building headed by Mr Andrew Gentry, the OECD’s Visits and Seminars Co-ordinator in the Public Affairs Division. This included a visit to the Château de la Muette, and a comprehensive overview of its history; as the place where King Louis XVI and Queen Marie-Antoinette walked without guards among their people, and the birthplace of several princes of France. Upon completion of the tour, the student group headed straight to the train station to return to Brussels. Thoroughly exhausted, but in good spirits, the student group booked into their accommodation and spent the remainder of the evening in the Grand Place. 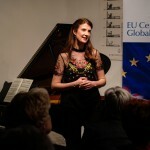 The day was centred at the European External Action Service. 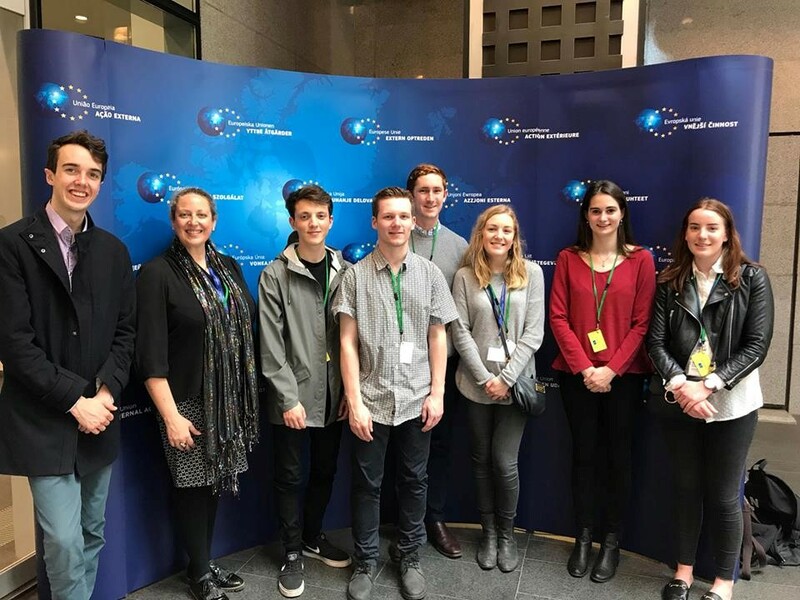 A variety of officials informed the student group about a range of political and economic issues relating to both the European Union (EU) and indeed the entire world. EEAS Climate Change advisor Pascal Delislie was the first speaker, who explained the challenges climate change not only poses to the planet but also security, through its consequences on mass migration, war, health, etc. He explained that whilst energy is the competency of individual Member States, there are substantial EU subsidies and supports for the renewable energy sector, such as those in the European Commission’s €3.98 billion European Energy Programme for Recovery (EEPR). There also exists an EU-wide Emissions Trading System, which Mr Delislie stated he believed is becoming the preferred method for targeting carbon emissions worldwide, despite Australia’s current ‘Direct Action’ auction system. This is because it provides a cap on carbon emissions and allows the price of carbon to adjust, making it simpler to reduce emissions by a certain level (in Europe, the target is 40% by 2030 from 1990 levels). A problem facing the EU has been its defence and security, and EEAS Press Officer Esther Osorio described some of the EU’s recent efforts in this field. Bringing together the defence of twenty-eight Member States is clearly a difficult task, and many of these countries have failed to reach the 2% funding figure stipulated by the North Atlantic Treaty Organisation (NATO). Highlighting this problem is the departure of the UK, which has the fifth largest defence budget worldwide. Ms Osorio provided the student group with information regarding the plans the EU has to further its defence capabilities, including plans to provide Member States with a framework which would enable them to invest in defence projects together that they could simply not afford by themselves. EEAS Strategic Communications Officer Milosz Labed explained the role of the High Representative for Foreign Affairs and Security Policy / Vice-President of the Commission Federica Mogherini, who represents the EU for a variety of international matters, such as the United Nations (UN), and in discussions with Australia’s Minister for Foreign Affairs Hon Julie Bishop, MP. EEAS Press Officer Adam Kaznowski also described his role to the group. Something he discussed was the active role the EU has in sending peace-keeping forces overseas to places such as Myanmar and parts of Africa. Many of the members of the study tour assumed such tasks were largely undertaken by the UN. The subsequent visit to the daily European Commission press briefing (the only EU institution to engage in such a practice) was exciting. The students had their first experience of simultaneous translation of French to English through headphones which they found quite stunning; the group was impressed by the professionalism of the proceedings. 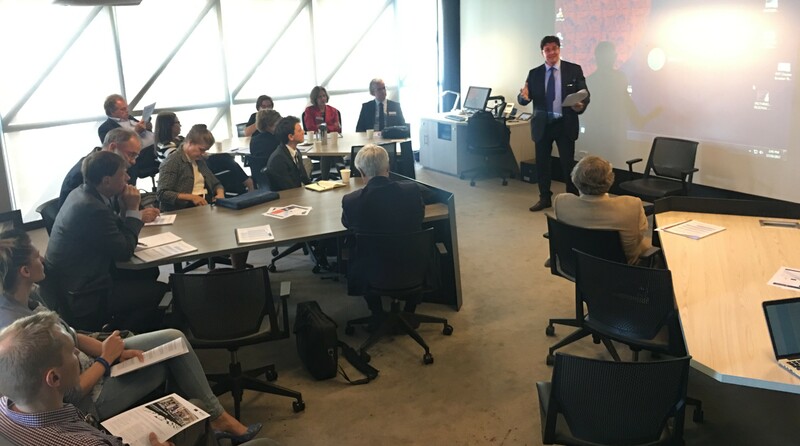 Both Mr Irek Momot, EEAS Policy Officer for Australia and New Zealand, and Mr Radek Wegrzyn, European Commission DG Trade Policy Coordinator for Australia and New Zealand, detailed recent development in Australia’s ties to the EU. In the context of the recent Framework Agreement signed August 7th 2017 and the impending Free Trade Agreement negotiations, these relations are as important as ever. Mr Wegrzyn stated that President Juncker’s plans to allow more decisions to be made in the European Parliament through qualified majority, rather than unanimity, could speed up the process of future EU trade deals. 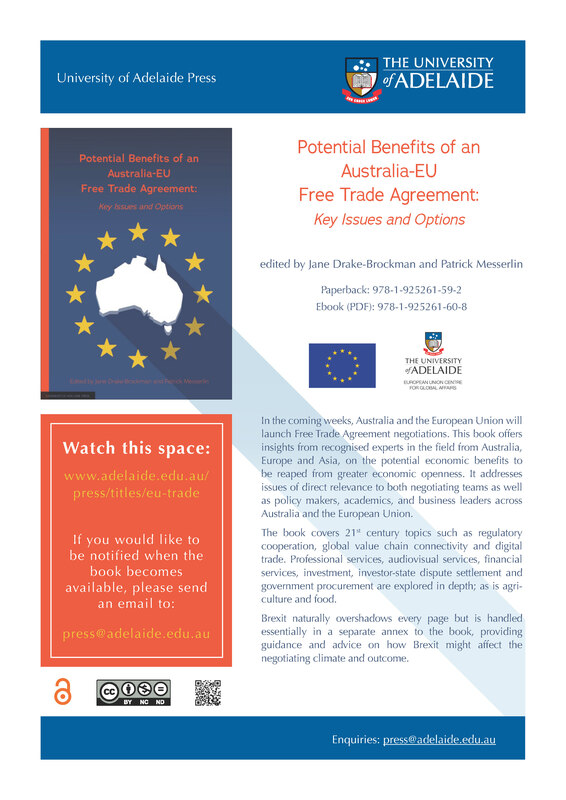 This could make the bold deadline anticipated for the EU-Australia FTA, which is essentially before the date of Brexit – 19th March 2019 – more achievable. He also commented that in his view Australia’s recent anti-dumping measures against imports of canned Italian tomatoes would have not have a significant impact on the FTA negotiations. At the completion of the day, the group visited Brussels’ Grand Place for the last time and enjoyed a beautiful meal, contemplating and discussing the wealth of information and insight from the visit.